If we haven't met yet, my name is Courtney McCarthy and I am the founder of Loyobo FIT. Today I wanted to share with you my story: how I discovered fitness, made the choice to become an instructor, and why I started Loyobo. My heaviest years, right before I moved to Ottawa in 2012. I was unhappy, struggling with IBS and hated my body. It started back in 2014. I was overweight and unhappy, living in Ottawa working a job I hated with the federal government and in a relationship that was taking a toll on my self-esteem. I was dealing with an IBS diagnosis and eating was a daily struggle with a lot of bloating and digestive discomfort. I was desperate and willing to try anything to make me feel better. I tried a pole dancing class (which was a lot of fun), all sorts of gym classes, I paid a ton of money for a personal trainer, I ran or did yoga every single morning. I hated the way I looked. I hated the way I felt. I lost a little bit of weight, but nothing really seemed to work. I tried eating vegan, and then raw/vegan. I tried the FODMAP diet, which involves excluding a very high number of foods from your diet to try to identify IBS triggers. I tried supplements and read books. Nothing really worked. I was still unhappy. I was still overweight. I was still fighting with my body every single day. Then, one day, I made the choice to try a Zumba class. I REALLY didn't want to. I had tried other dance fitness classes before and I always felt uncomfortable. But, as I said, I was desperate and willing to try anything: so I went. It was lead by a woman named Dana who was funny, full of smiles and incredibly welcoming. The dances were easy and for the first time in a long time, I had fun at the gym. For one hour, I forgot about hating my body and I just moved. It felt AWESOME! Right away, I knew I was hooked. Co-teaching a song with the amazing Susana after I became an instructor in 2014! For the next few months, I was up every Saturday morning for that 9:15am Zumba class. Nothing could stop me from going. It was a date with myself that I looked forward to all week. My confidence started increasing, I was making friends in class, and I finally started to see some results! I was sweating and feeling stronger and some of the weight was coming off. In fact, I started doing TWO Zumba classes back to back with another amazing woman named Susana at the same club. Dana was the first one who brought up the idea of becoming an instructor myself. With encouragement from both her and Susana, I signed up for a training that December. I knew that I had a very strong desire to give other woman the same feeling that those two ladies had given me: a safe space to enjoy my body and have fun! Around the same time, I also started working with a nutritionist who rocked my world: Jumanah Beck from Earth Suit Nutrition . She helped me identify my IBS triggers and figure out what foods worked with my body. Between my new love of Zumba and this amazing new relationship with food, before I knew it I had lost over 35lbs. I still wasn't happy with myself or my body, but at least I was seeing change. After moving to Guelph, teaching 3-5 Zumba classes a week & learning to love my body! Things went on the back burner, though. In February 2015, my grandmother became terminally ill and I took time off work to take care of her and my family in her final months. During that time, I did a lot of soul searching and it hit home just how truly unhappy I was in Ottawa. It was the most difficult decision I have ever had to make, but I made the choice to leave the man I was with, quit my job and move back to Guelph. After a lot of change and transition, it took me until December 2015 to finally feel settled and find my own routine in Guelph. My attention then got pulled back to Zumba. I decided to take a chance and begin applying for instructor jobs. Very shortly after, I accepted my first job at LA Fitness in Milton. As soon as I started teaching, I knew this was it. This was my happy place and I loved every second of it. My view was beginning to shift: now my body felt like home and I recognized that the more I took care of it, the better I felt and the more I could do both as an individual and as an instructor. I had lost a total of 45 lbs and my IBS symptoms were gone! As the months went on, I began accepting more classes at other facilities: Shake it Off Studio in Guelph, the University of Guelph Athletic Centre, World Gym (now Crunch Fitness) and others. I was learning A LOT about the fitness industry and there were many things that I found incredibly frustrating! 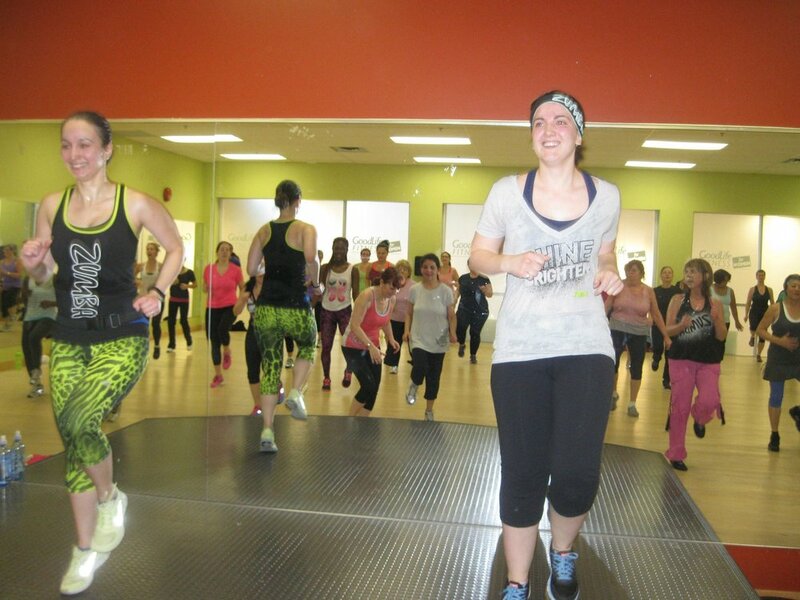 Teaching Zumba in Guelph, Summer 2016. The industry revolved a lot around money and making people huge promises of life-changing results that often were unrealistic or unhealthy. Instructors were underpaid and undervalued - especially when it came to Zumba. There seemed to be a lack of empathy and such a huge focus on one ideal "bikini body", extreme results and on outer appearances. Women above the age of 50 seemed to be ignored. I felt stifled by strict rules, a lack of innovation and a low interest by management in truly listening to what member's wanted. So, in April 2017 I decided I wanted to do it my own way. I wanted to follow the journey of what worked for me: focusing on movement, helping people find joy in fitness and learn to love their body by defining their own version of health and success. To help people, especially woman, learn how to listen to their bodies and see their own strength. So, I offered my first round of bootcamp classes (3 times a week) in downtown Guelph and at Exhibition Park. In December 2017, after a lot of hard work and planning, those classes became "Loyobo FIT". The vision for my business has grown and my desire is to prove that fitness can be done differently. In the next two years, my goal is to open my own studio which will offer group fitness classes, training, educational workshops, online classes and other services that help people to learn about fitness, nurition, mental health, and healthy living. I hope that you are as excited as I am to be part of this journey! We have started this amazing #LoyoboFamily and I cannot wait to see what comes next. Newer PostMeet Kathy - March's Member of the Month! Older PostMeet Lori - Our First Member of the Month!